Learn how to get Snooki hair with this Howcast hair tutorial featuring celebrity hairstylist Jacqueline Bush. So, now I am going to show you how to get hair like Snooki. Te first thing we gotta do is we gotta flat iron the hair, Snooki lovers her super super straight look. So what I am gonna to is put a little heat protector in the hair. 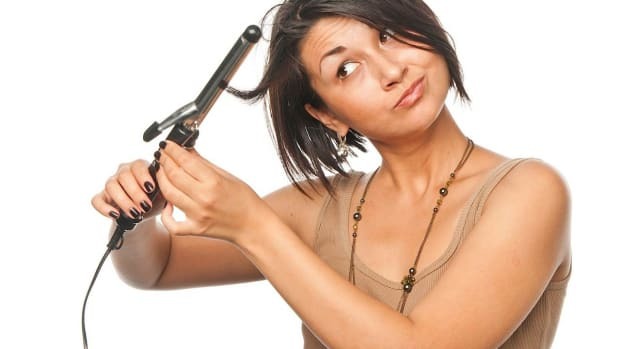 &apos;Cos you remember we always put in heat protector before we use hot tools on the hair. Gonna run that through the hair, and then were gonna start, section by section, im gonna clip that out of the way so I can get in there. And remember you flat iron the hair, because we need it very very precise, for this one, you gotta get right up into in root. Take it all the way down, go through. I&apos;ve shown you in another video more particularly how to flat iron the hair. So were gonna do that and then we&apos;ll get back to you. So I&apos;ve just finished flat ironing the whole head of hair, its nice and straight. Were gonna take out the crown section, which is just from about an inch to two inches back to the back of the head which is right- you can measure that like right behind. Se we&apos;re gonna take out this section, then, we&apos;re gonna pull this part away from her, were gonna section off this, were gonna tease this section, we&apos;re gonna tease this a lot, a big bump. And if you don&apos;t know how to tease I have a clip of that in another how to video, on how to tease the hair. Now we&apos;re gonna tease the next section, this is very similar to my video of how to do a hair bump, except its a more extreme version. So then we have our big teasing section, right, this is already looking very Snooki. Then we&apos;re going to smooth it out, were gonna spray it, to give it some hold. We&apos;re gonna lock that spray in with the blow dryer. Then, make sure the shape is the way we like it, you know they like a lot of hair on the Jersey Shore. So you can either role it under, or we can just pin it, which is what i&apos;m gonna do. So you take a few pins and I have another video showing you how to attach those bobby pins. Get it up nice and high. The difference between the Snooki bump and a regular bump is is how high you go. You gonna &apos;X&apos; those, just two pins is all you need. Turn back round for me. You could even go a little higher so im gonna stick one more pin in there, now we&apos;re just gonna brush the rest of the hair with some hair spray on the brush. What this does is it locks down all those little flyaways, and thats how you get the Snooki bump.